Since the foundation of the ecosystem services concept in the ninetieth of the last century ( Costanza et al. 1998, Costanza et al. 1997, de Groot 1992 ), many methods to map and assess ecosystem services have been developed and applied to policy and business questions worldwide. While many flexible methods exist at different spatial scales and ecosystem types, Jax et al. (2018) express the difficulty in choosing and applying the correct method to the right topic of interest. To enable a selection of appropriate methods, Harrison et al. (2018) developed a decision tree approach. However, Dunford et al. (2018) argue that often not a single method but a combination of methods are required for appropriate decision-making in real world situations. Thus, applying the concept of ecosystem services in practice is challenging, especially at institutional level ( Saarikoski et al. 2018 ). This hampers comparability, applicability and transferability of ecosystem services assessments and related mapping applications across scales and European regions. It also impedes a solid overview of existing methods suitable for use at different scales in different biomes and types of ecosystems. These challenges require a consistent knowledge capitalisation infrastructure, where information is synthesised in a publicly accessible portal to enable a consistent description of different ecosystem conditions and the services they provide. Going beyond the previously mentioned challenges requires a flexible methodology for assessing and mapping ecosystem services. 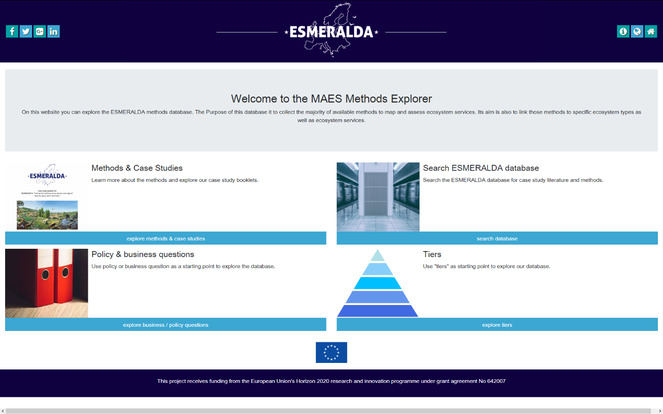 The Horizon 2020 project ESMERALDA (Enhancing ecoSysteM sERvices mApping for poLicy and Decision mAking) developed this methodology and implemented it into the "MAES explorer" *5 and the "MAES Methods Explorer *1 (MME)". The MME complements previous developments from the EU projects OpenNESS *2 and OPERAs *3 . In contrast to the OPPLA *4 case-study-finder with case study areas and accompanied study area booklets and descriptions, MME focuses on methods for mapping and assessing ecosystem services and links those to selected literature and case studies. Additionally, MME provides a comprehensive and publicly searchable collection of peer-reviewed journal references and grey literature about mapping and assessing ecosystem services in Europe. This compilation is cross-related with the case study booklets produced by the ESMERALDA project and particularly methods, which are specifically used to assess and map particular ecosystem services within the case study area. Thus, searching for and filtering of particular case study areas, (related) literature references and/or methods is possible. Santos-Martin et al. (2018) provide the detailed description about the scientific procedure behind the MME tool described here. The ESMERALDA project supports European member states and affiliated countries in fulfilling their obligations in relation to the European Biodiversity Strategy, in particular Target 2 and Action 5 "Mapping and Assessment of Ecosystems and their Services" (MAES)( European Commission 2011 ). Santos-Martin et al. (2018) describe the process of creating the database of existing studies on mapping and assesing ecosystem services (ES). This database is the basis for the MME described in this paper. This database builds on existing Ecosystem Service (ES) projects and databases (e.g. MEAS, OpenNESS, OPERAs) and particularly the tiered approach after Grêt-Regamey et al. (2015) . The overall objective of this database and the resulting MME tool is to support the selection of appropriate methods or combination of methods to carry out mapping and assessment of ES, depending on local to regional preconditions. These preconditions for selection can be data and time requirements, expertise, knowledge and experience or the purposes of investigation (e.g. specific policy questions). Another objective is to share experiences through co-creation of knowledge and promotion of an active dialogue via social media and active user groups, like that implemented in OPPLA *4 . This open access tool connects different policy domains and policy/business objectives and has the potential to be interlinked with the MAES explorer *5 and the Ecosystem Services Partnership (ESP) Visualisation tool *6 . Active participation and engagement of stakeholders, policy makers and practitioners in the development phase during the project runtime should ensure 'quality controlled' database entries, meaningful search algorithms, an applicable graphical user interface and handling of the different toolsets created. The ESMERALDA project specifically focuses on ecosystem services assessments and mappings within European member states but is not limited to them. Literature searches predominantly happened with a focus on European study areas and description of those in literature. However, references also include outer European territories and references and related methods used within them. 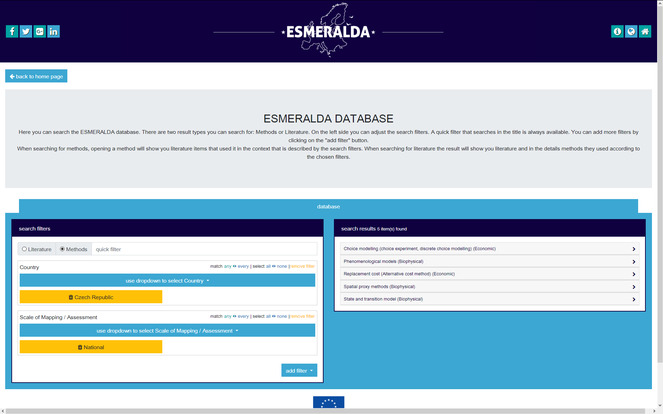 To ensure a seamless and independent public access of information about literature, methods and case study areas dealing with ecosystem services, a web-based platform has been chosen by the ESMERALDA consortium members. The process of the creation of the underlying database is explained in Santos-Martin et al. (2018) . The resulting spreadsheet document was transformed into a web-accessible database. The latter consists of ecosystem services methods grouped into three spheres: 1. the biophysical, 2. economic and 3. the social sphere. This categorisation enables a quick filtering of literature and methods according to the main subject of interest. In stakeholder meetings, practitioners and policy-makers pre-defined further filters of interest ( Table 1 ). Search filters implemented by the webtool. The business / policy domain that is covered by the study. The country / countries covered by the study. The Domain of the method used (biophysical, economic or social). The ecosystem service that was mapped / assessed. The ecosystem type that was mapped / assessed. The method(s) used to map / assess. The scale of the assessment / mapping (local, regional, national, multinational). The tier that was applied. To enable a method-centred view on the reviewed literature and the case studies, underlying references are cross-linked with an additional document – the "method compendium" – described in Santos-Martin et al. (2018) , Table 1. The method compendium lists and describes each method in relation to their biophysical, economic and social sphere. While the data collection method and content of the database is described in detail in Santos-Martin et al. (2018) , the setup of the database is explained here. The output of the aforementioned process was a spreadsheet document that needed to be transformed and normalised into a relational database model ( Fig. 1 ). Study: Representing a case study with their referenced literature items and basic metadata like authors, year, title, DOI etc. Method: A particular method from the method compendium ( Santos-Martin et al. 2018 ), described with additional metadata such as domain (biophysical, economic, social). Use of method: This constitutes the M:N relationship of methods and studies, containing attributes like ecosystem service assessed, tier, scale etc. Moreover the dataset was further normalised by creating look-up tables on additional parameters – such as ecosystem types or ecosystem services. Finally, the spreadsheet document was imported into a SQL database for web-enabling storage, data input and data retrieval. The development of a user-friendly graphical user interface (GUI) for searching ecosystem services assessments and mapping methods resulted in four main parts ( Fig. 2 ). The option "Search ESMERALDA database" opens the search mask with filtering options ( Fig. 3 ). The search mask is subdivided into two columns. The left column comprises the user defined search parameters, while the right column instantly displays the matching results. Searches can apply to either 372 literature references or 42 methods that match the search parameters. Additionally, a free text filter (quick filter) searches keywords in the title and author section. All of these filters can be switched on and off individually. They offer options to either match all selected values (AND) or any selected value (OR). Screenshot showing the search result page. On the left, the search filters can be configured and the right column shows the entries that match the filter. 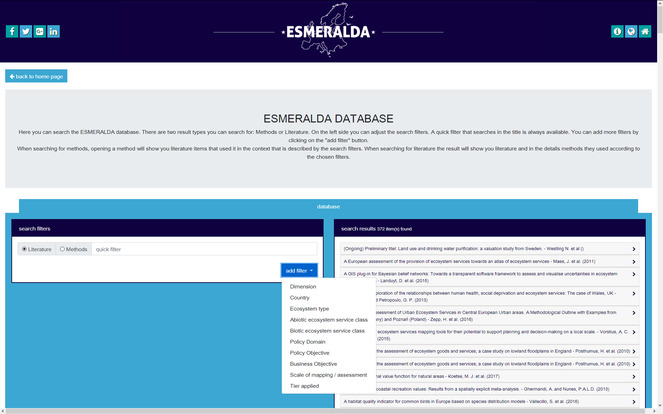 Pre-configured search parameters help integrating additional ESMERALDA products. Amongst them are case study booklets e.g. the example from Czech Republic in ( Fig. 4 ). While the booklet gives detailed and comprehensive information about the use case, users can find similar items in the database. This helps the user to find either other applications for a given method in a specific context or other methods that have been used in a specific context. The result view is subject for further investigation and enables end-user tailoring towards their demands using the given filters ( Fig. 5 ). Selecting a fact sheet in the search mask results in pre-configured results showing the assessed ecosystem services, scales and location of the case studies described in the fact sheet. This enables end-users to find items of interest being similar to the case study described. Screenshot showing the case study fact sheets that can be accessed via the tool website. From here, a pre-configured search mask, specific to the selected case-study booklet can be opened. Tailoring down results of methods used at national level in Czech Republic. Similar to the implementation of sections of the tiered approach and the policy questions, these pre-configurations are realised as Uniform Resource Locator (URL) parameters to the search mask. This parameterised web-link enables a pre-defined set of searches to be exchanged (e.g. via email) to third parties. With scientists, practitioners, stakeholders and policy-makers involved, ESMERALDA was able to provide a web-based framework to enable public access to resources and descriptions of ecosystem services assessments and mappings. This includes descriptions of meaningful case study area examples, a collection of 372 peer-reviewed and grey literature references. It further lists fully described methods from three domains (biophysical, economic and socio-cultural) and applications that have been used to assess and map ecosystem services. Filtering and searching is possible through pre-defined keywords, enabling a tailored view to end-users demanded methods, case studies or further readings. In this article, we have presented a web tool that enables interested users to browse the ESMERALDA methods database online on resources for ecosystem service assessments and mappings. We demonstrated flexible search filters that provide non-experienced users with pre-configured entry points into the datasets. The MME tool is open to more entry points, without changing the web-tool itself. Thus, to leverage the full potential of the tool and the database itself, further developments could include new entry points defined by end-users. These entry points might be considered in combination with a seamless integration of other community driven portals and tools. This seamless integration would require standardised and thus compatible interfaces at both server sides and a minimum of mandatory ISO 19115 metadata standard entries ( ISO 2003 ). Implementation of a Catalogue Service Web ( OGC 2007 ) with a related server infrastructure would also enable a consistent user management and capturing of further entries into the existing database after the ESMERALDA lifetime. Thus, without maintenance of the existing developments, the datasets will be outdated and soon useless. However, additional entries captured by users require a quality check by experts. Thus, time and money should be invested to ensure appropriate development into a sustainable ecosystem management infrastructure in future. Having developed a solid infrastructure about case studies, methods and literature, linking spatio-temporal data and metadata would be desirable as a next step to enable direct linking from a case study to its data and implementation. This should go beyond a download service as presently implemented at the Ecosystem Service Partnership Service webpage *10 . State-of-the-art and INSPIRE (Directive 2007/2/EC) compliant is an on demand service, where datasets can be directly integrated into modelling environments. Thus, providing environmental information about methods and related dataset requirements, e.g. after the environmental information directive (Directive 2003/4/EC), are not enough. Modelling approaches should be developed as a cloud service where end-users not only receive written information about the method itself but are able to spatially process their ecosystem service potentials of interest with Web Processing Services (WPS) when connecting data, metadata and processing tools based on the methods listed in the tool ( Castronova et al. 2013, Giuliani et al. 2012 ). Presently missing is the spatio-temporal view on the database resources. Spatial map interactions going beyond the visualisation of case study maps – as, for example, outlined by Bojovic et al. (2017) – have not been implemented. 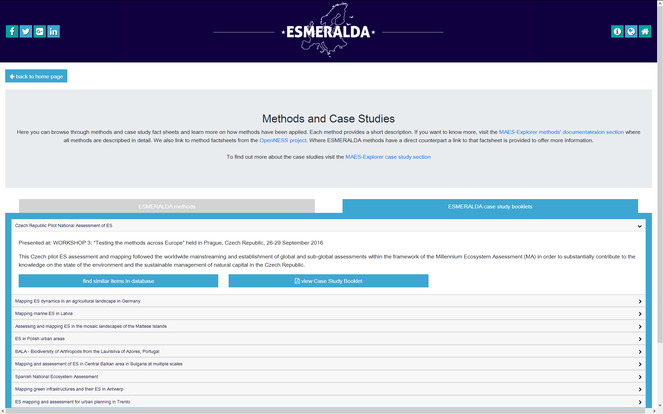 Moreover, the case study areas represented in ESMERALDA and OpenNESS are static and thus probably will not be updated in the future. Automated processing routines towards the selection of case study areas of interest from a map interface could solve the challenge. Kmoch et al. (2018) demonstrate that particular topic-related and location-related knowledge could be on demand extracted from publicly accessible journal articles. At the same time, case study information could link to metadata and data services, connected to ecosystem service methods implemented as WPS for on-demand processing. This would increase trust, credibility, reliability and repeatability of ecosystem services studies, since information about the data (metadata), the data itself, the processing routines and related results are subject to public review at any time. How this geoprocessing and transparent delivery of information can be done has been exemplified by Bertermann et al. (2014) and Bertermann et al. (2015) . They provide an example for the estimation of very shallow geothermal energy potentials for the local and pan-European scale, based on many publicly available datasets, which are described in publicly accessible catalogues. However, on-demand cloud-based processing of these potentials have not been fully implemented by them. Altogether, these recommendations could lead to a European Ecosystem Service Portal, where standardised web services are connected according to the role model from Klug and Kmoch (2014) . Open Geospatial Consortium (OGC) standard compliant distributed web services on data (Web Feature Service, OGC (2010a) , Web Coverage Service, OGC (2010b) ), metadata (Catalogue Service Web) and publicly available WPS on ecosystem service models described in literature bear the potential for web-enabled ecosystem services assessments and mappings. Standard users on ecosystem services assessments and mapping would not need to set up their own computer environment, but use online tools. Data searches and data access could happen from office desktops, while cloud computers could use extendable computing resources. Decoupled spatial resources should be streamlined into an "Automated Geosynthesis", where Geosynthesis is committed to the combination of spatio-temporal components or elements on the Earth (e.g. soil, geology, water) to form an interconnected whole. Considering the sum as an entity greater than the amount of its single elements, the Geosynthesis should provide spatio-temporal improvements in the understanding of the processes and functions operating in landscapes in order to derive ecosystem services out of them. This refers not necessarily to environmental parameters only but also includes social and economic properties. Thus, in future, the focus should be not looking at one particular method but a combination of methods to be used for analyses. Once the methods provided in MMA become operational via web interfaces, the Automated Geosynthesis should deliver on-demand operational (web-)services and products that assemble publicly accessible geo-spatial information and ecosystem services methods from distributed Spatial Data Infrastructures (SDI) for complex analysis. Results should enhance and support the qualified decision-making process in a more efficient and effective way as manual desktop based assessments. Scattered spatio-temporal information is expected to be requested at the time needed, rather than previously copying (already outdated resources) from one source to another. Requests for information retrieval can be triggered either by human or automatically by changing (raster/vector) datasets or by near real-time operational sensors analysing the present state of the environment. Compared to hard copy offline information, the internet, as a fast, efficient and effective information distribution medium, offers sufficient capabilities to provide continuously updated and 'live' information on ecosystem services (supply and demand), as, for instance, started with the Ecosystem Service Partnership map viewer *6 ( Drakou et al. (2015) ). The Automated Geosynthesis uses available standardised services providing a benefit to already existing primary information pieces. Formulated rulesets and modelling procedures ensure temporal and stakeholder defined information supply. Due to standardised provision of previously uncompatible datasets, these can now be capitalised and provide the capacity for further cross-comparable analysis, e.g. as demonstrated with the CLIDB (Climate Database) and the NGMP (National Groundwater Monitoring Programme) database in New Zealand ( Kmoch et al. (2016) ). Based on the state-of-the-art possibilities, the innovations achieved with the MME database are minor, but compared to the project resources available for this task are of high importance. MME could operate as a starting point for further applied research, where the application of existing standards and to be derived ecosystem services standards are getting more into focus. Nevertheless, the unique selling point of the online tool is the collection of existing studies as an essential step to find methods most suitable for mapping and assessing ecosystems in a particular region at a specific scale. This project receives funding from the European Union's Horizon 2020 research and innovation programme under grant agreement No 642007.